This envelope from Galashiels, Scotland was recovered from the Imperial Airways Short S23 C-Class seaplane CALPURNIA G-AETW which landed very heavily on Lake Ramadi on 27th November 1938 during a severe storm and in the dark. The pilot had mistaken the lake for the usual landing place on Lake Habbaniyah a few miles away. The flight crew were killed and the three other air line personnel on board were injured. RAF personnel from Habbaniyah and air line staff from Basrah salvaged letters floating on the lake surface accounting for nearly a quarter of the heavy Christmas mails. After drying, the mail was forwarded mainly to Iran, Australia and New Zealand where a large variety of cachets were applied. This cover was sent to Adelaide where this typed note was attached. It is to be noted that B.H. Brown was also the Mail Superintendent for Victoria, where similar notes accompanied mail for that State. 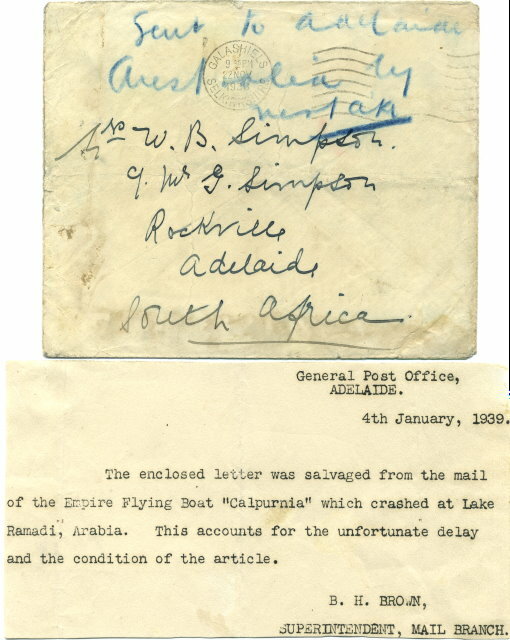 It is ironic that this letter was wrongly sorted in London and should never have been loaded on to this leg from Cairo to Baghdad, rather it should have been sent south from Cairo on the South African Service of Imperial Airways.